Doing away with paper in the office is getting easier with many new tools including scanners, the iPad and cloud storage. As much as we try though, there are times we still need to jot a note down on a peice of paper. Also, there is the communication with customers. 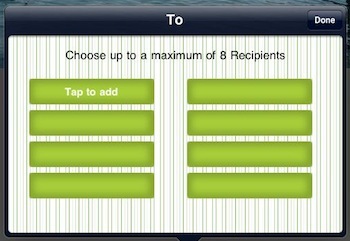 An app we have started to use with pretty good results is Simply Postcards. 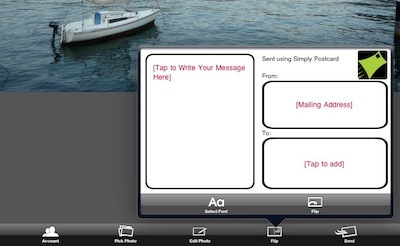 One of several options available for the iPad that allows you to take an image and have it printed/mailed as a postcard. 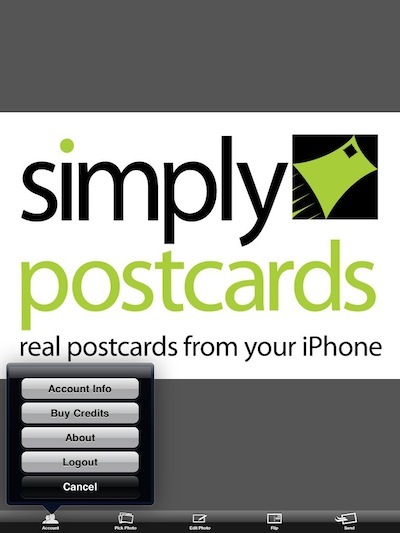 Simply Postcards is a free universal app which you use to create the postcards; your images, message, ‘from’ address and up to eight ‘mail-to’ addresses per card. 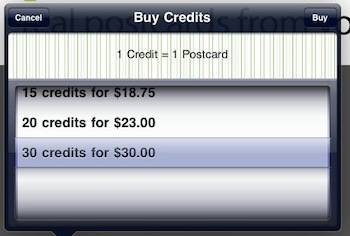 The card is sent from the app to the Simply Postcards service who charges you a per unit print/mailing. There are several other ‘postcard’ apps available that we use for creating electronic postcards which we will cover late, this solution is for producing printed full color postcards that are mailed. Signing up for a free account is necessary to use the app and service. You then buy the postcard ‘service’ which is the printing and mailing. We have seen mentions of this app saying that it is only $1 to do a single card to a US address and about $2 for International and complaints that those are not correct prices. 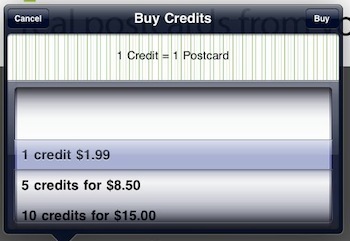 As you can see below, the Simply Postcard service is sold as a single or multi Postcard packages. The more you buy, the lower the per unit price. You don’t have to use all of the bundle at one time, you can send single postcards working against a 30 unit bundle purchase. Buying the bundles works well if you don’t mind being out a little cash up front when you know you will be using the service. We blew through a lot of cards pretty quickly as we used them as follow on to meetings and sales calls. Included in the current software is four outlines that can be used over your images. 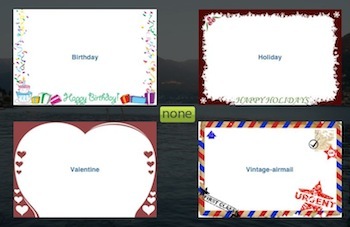 Nice if your using the postcards for a party or holiday greetings. Non are corporate enough for us to use but the developer has promised more options in the near future. The image turning tools in the Simple Postcards app are very light. You can flip the image and adjust the brightness. We use our other photo editing apps to tune our images prior to choosing to use as a postcard image. Adding text to the card is as simple as taping the box and typing. 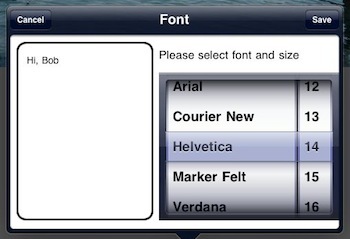 Font type and size is adjusted through a roller. 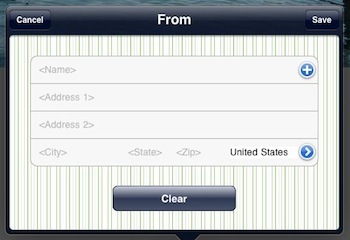 Send-to addresses are pulled from the Contacts area of your iPad. Tap the green box and choose an address. Up to eight can be added per print/mailing run. If you need more you can send, return to the card to add/change more then send more. The ‘From’ address does not have to be the same every time. Enter one and save to re-use or edit as needed. Simply Postcards is a ‘simple’ way to keep customers and family remembering you the old fashion way.